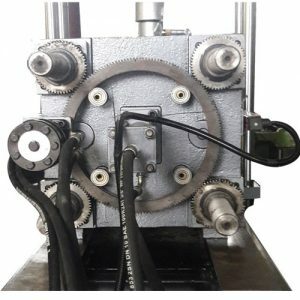 L-Type Clamping Unit – Emactra Machine Industries India is a leading manufacturers and exporters of industrial presses. High rigidity and strong Clamping Unit with Large and wide space between tie bar. Optimized design mechanical and toggle system for faster cycle time and improve production efficiency. Movable Platen Supported by the adjustable support system for improvement of platen parallelism. Low Pressure Mould safety device and mould adjustment design perfectly. Protected by double safety interlock of Mechanical and Electrical Safety. Upgraded parts bush use in toggle and platen.